When I was a kid, I heard Italy referred to as the country that “looks like a boot”. This description gave me a feeling that Italy was the sort of place that would be instantly recognized, if not from it’s map-friendly shape then from the taste of the food, the feel of the wind, the cut of the coastline, the essence of the wine. It was like, you know, Italy! Years later I got my chance to find out for myself if Italy would take hold of me and prove her identity with the boldness she’d obtained in my imagination. Would the meals fill me up beyond lunch the next day? Would the conversation fill the tables with hand-spoken arguments? Would the scenery fill my heart with beauty and wonder? Would the sea fill my mind with uncertainty about my little-me space in this world? The Salento is sun-kissed year round. Alongside art, excellent Mediterranean cuisine, and genuine hospitality, the area boasts a fabulous landscape, ranging from the Adriatic coast and the marinas of Melendugno, Santa Cesarea Terme and Otranto, to the Ionian Sea and towns like Porto Cesareo, Portoselvaggio and Gallipoli. Here, the Middle Ages are tinged with an Oriental hue and, in Grecìa Salentina, you can still hear ancient nursery rhymes in the Griko dialect. In towns like Melpignano ancient rhythms are turned into contemporary music at the Notte della Taranta festival. A green peninsula fringed by two seas, this is a magical land in which mysterious dolmens and menhirs indicate the way, hidden amidst the olive trees and drystone walls of the countryside between Giurdignano and Minervino di Lecce, and where ancient masserie (manor farms) have been transformed into sophisticated hotels. Take a hike and discover Early Christian churches and hypogeum olive-presses. Be sure not to miss the natural wonders of the sea caves at Castro and Santa Maria di Leuca. A stroll through Lecce is a journey into the Baroque, with churches and palazzos embroidered in stone, and courtyards, secret gardens and a surprising Roman amphitheater in the heart of the city. In Brindisi, you can visit two castles and enjoy views from the Regina Margherita seafront. We built the evening around the wine, a bottle I bought at my local shop, The Corkscrew. It’s a 2008 from the Copertino DOC (Deominazione di Origine Controllata). 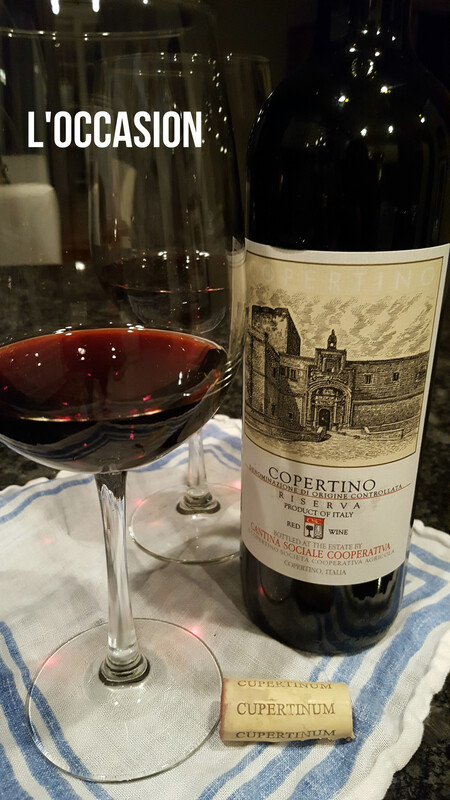 Copertino Riserva Red Wine is created by the Cantina Social Cooperativa, a commune in Salento, and is made from 95% Negromaro grapes, topped with 5% Malvasia nera grapes. 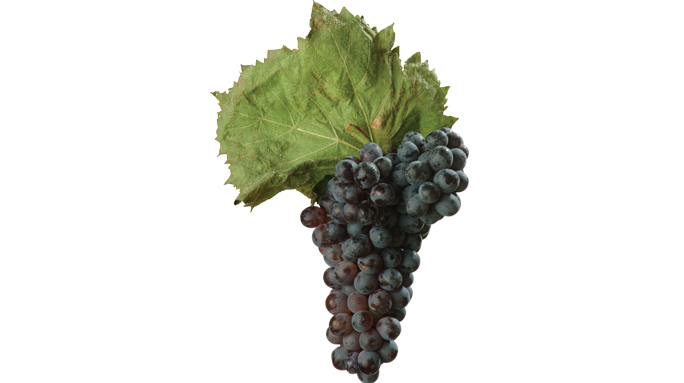 Negromaro grapes are known for their dark skin (perhaps gaining their name from the rich tint of the grapes) and medium-full tannins. The wine is aged for at least two years before release. This wine is a ruby-colored mama, a color as close to the jewel as you’d find in any vintage shop. It needed a bit, being a few years old and quite intense. Flavors opened up nicely, quite a rich nest: warm berries, a little nutty. I’m apt to find a gaminess too. Substantial, deep. Old money saved up, leather purse. I’m intrigued by the history of the commune, a decades old collaboration of regional winemakers. In 1935, 36 wine-growers came together (“setting aside the individualism that characterized the area” according the co-op’s website) to form the winegrowers group that still releases wine to this day, now with over 350 growers involved under the name The Cupertinum. 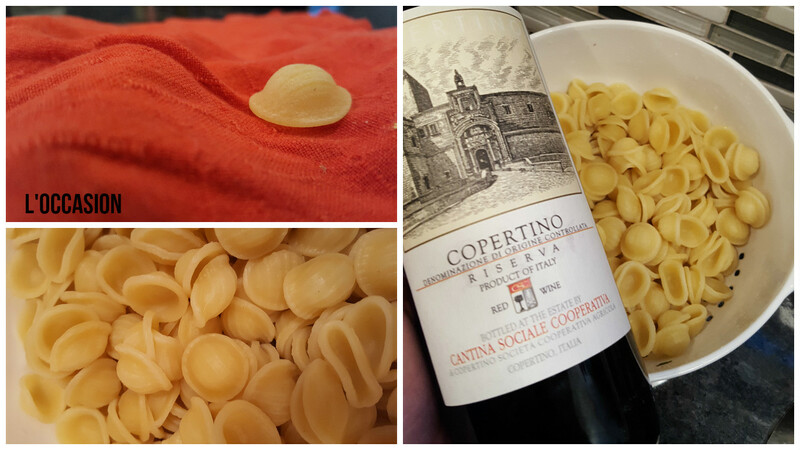 We paired the wine with a set of pastas, the highlight being the regional Orecchiette, named after its delicate shape which is said to resemble a little ear. My husband prepared the pasta with a mix of sautéed mushrooms and shallots, covered in a tomato basil sauce, and enhanced (ever so lightly, of course) with parmesan cheese and fresh basil. For variety he mixed in a few potato gnocchi (not a regional item). We invited a few friends over to share in the special evening and also served a lasagna (based on this recipe from Un Assiago). 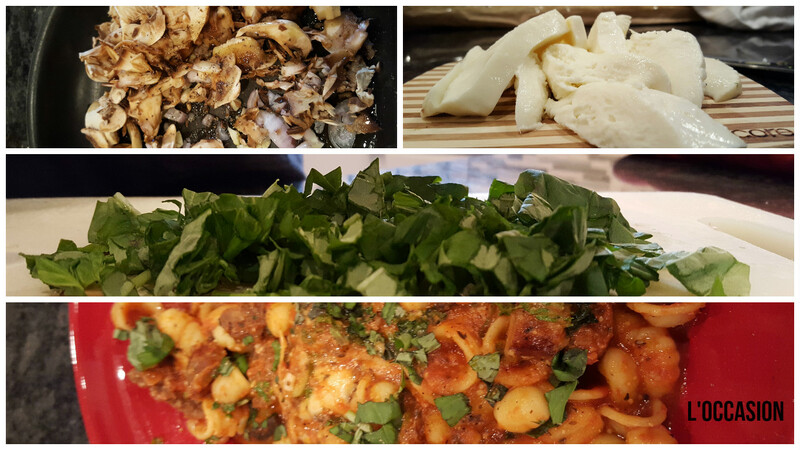 The delightful makings of our meal. It was an evening of old friends, children playing, an early dessert and of course wine and a great meal. It seems that all over our Earth this type of evening is what we live for. Relishing a moment shared with friends over a bottle of wine from years ago and miles away certainly makes space and time seem comfortable, like anything is possible. This post is in collaboration with a set of bloggers joined together under the name #ItalianFWT… Food, wine, travel. What else? Join us on this adventure, a journey of the imagination and senses that disembodies passports, planes and press passes. 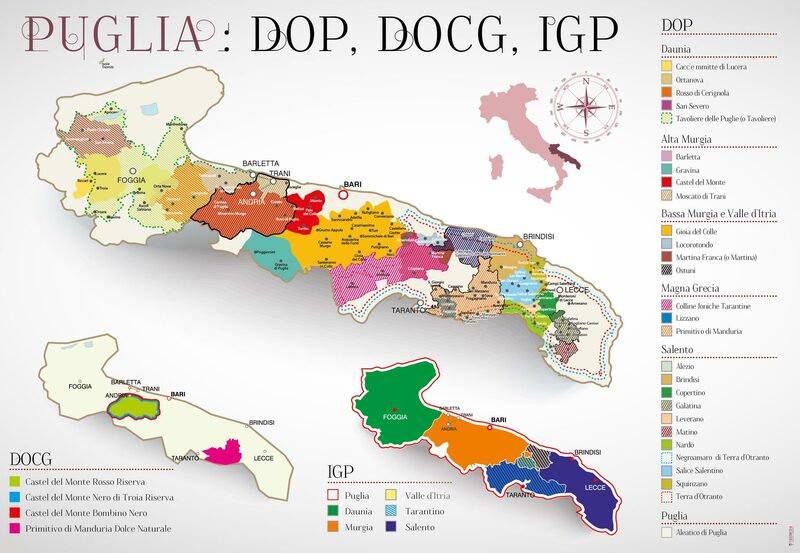 Guess what, we are going to Puglia today: Join our live Twitter chat Saturday April 2nd @ 11am EST at #ItalianFWT. On Saturday May 7th we celebrate Lombardy. One of the areas I still have to discover – thanks for that mouth-watering introduction to it! Doesn’t it sound wonderful in Puglia? Wonderful post! 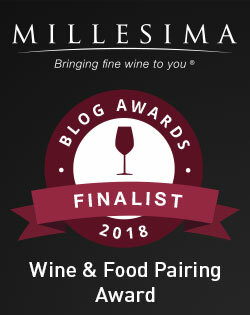 As I was writing my own post, I was ready to hop a plane and head to Puglia. Your post took me there. Thanks so much — absolutely can’t wait to see it for myself. Looking forward to #ItalianFWT & all the delights it offers. Oooh, you’ll have to share the details about the trip…. assuming you decide to come back!! Beautifully written in many ways! Glad to have you join us! Love this great morning of pouring over Puglia! Love this. I want to be that old friend. And the setting at home and in the heel sounds lovely. As usual, I love your newsletter. Well done! Thank you! There’s a lot to love in Puglia! Cheers! Really enjoyed this post. Puglia was on our horizon for this part of our travels until we secured a house sit in Brittany, France. We’ve not given up on the south of Italy though, there’s always more travel to come and Italian wine is a great incentive. I look forward to exploring more on your blog. Cheers, Sue. Thank you for sharing! I think a house in beautiful Brittany sounds delightful!